Adorn a stylish coffee table or a sun-washed kitchen counter with these lovely, fragrant Stargazer lilies, best enjoyed by many. 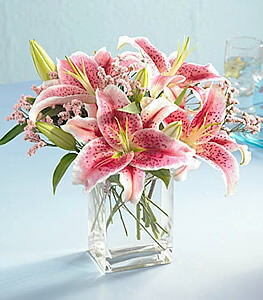 Enhanced with sprays of delicate limonium, lilies are beautifully arranged in a clear glass cube vase. Vase may vary from item pictured.